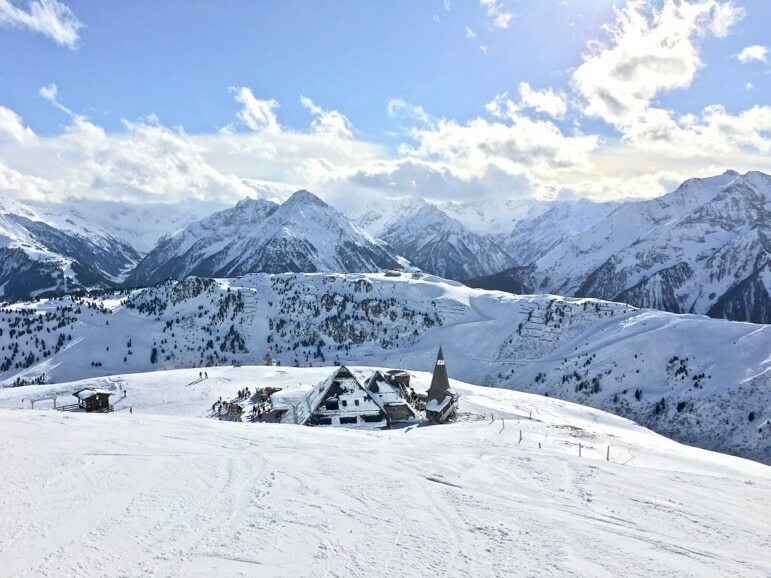 With more than 500 kilometres of pistes to explore and the offer of 365 days in which you can ski in the year, the Zillertal Valley, in Austria’s Tirol, is one of the best ski resorts in the world. 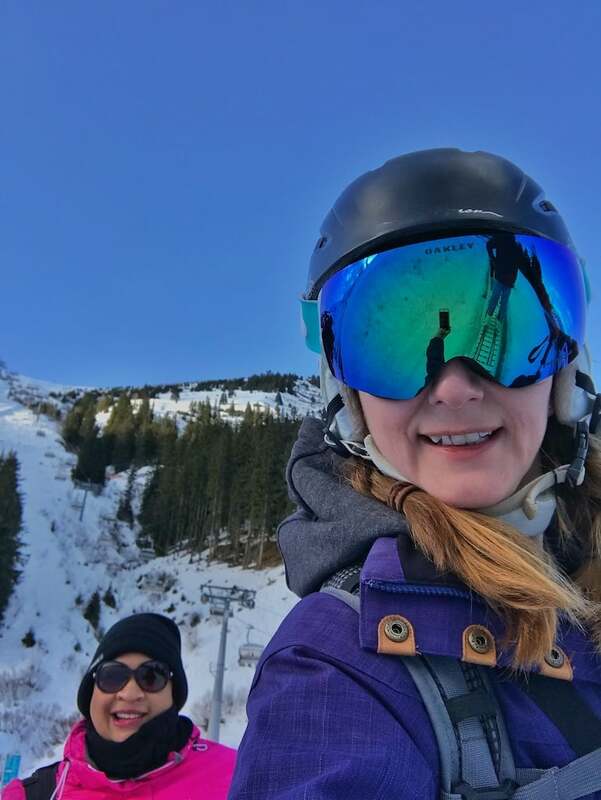 My winter-sports loving friend Shelley and I recently took a trip across the country taking in four of Austria’s ski regions, starting with the Zillertal ski resort (don’t miss our other guides on the total ski fun of Skicircus, the city, lake and mountains of Zell am See-Kaprun and Carinthia). 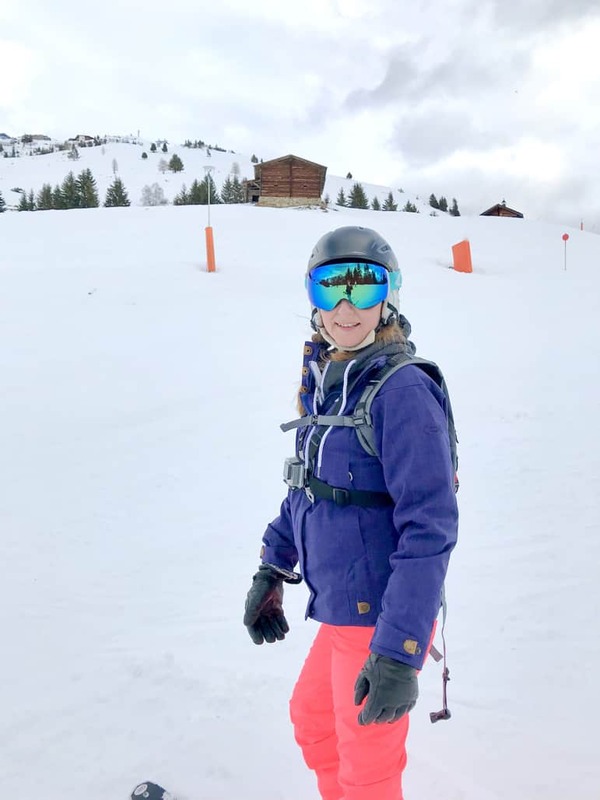 There’s little more thrilling than the sound your boots make as they line up and solidly clip into your skis on your first day on the slopes in winter. Mine made that clunking sound at the top of the Mayhofner Bergbahnen and I soon shot down the slopes. 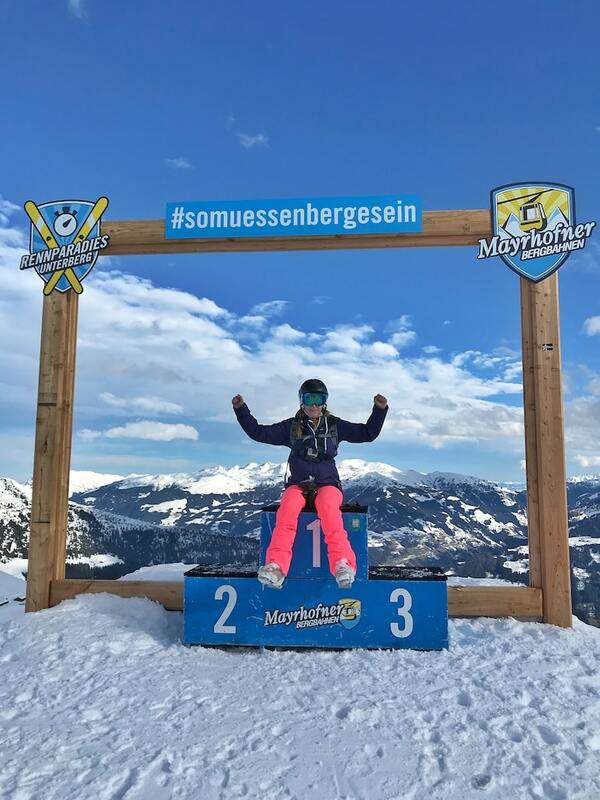 Mayhofner Bergbahnen is one of four key ski areas – the others being Hochzillertal-Hocfugen-Spieljoch, Zillertal Arena, and Ski & Gletscherwelt Zillertal 3000 – in the Zillertal ski resort, and they’re all covered by the Zillertal Superskipass. 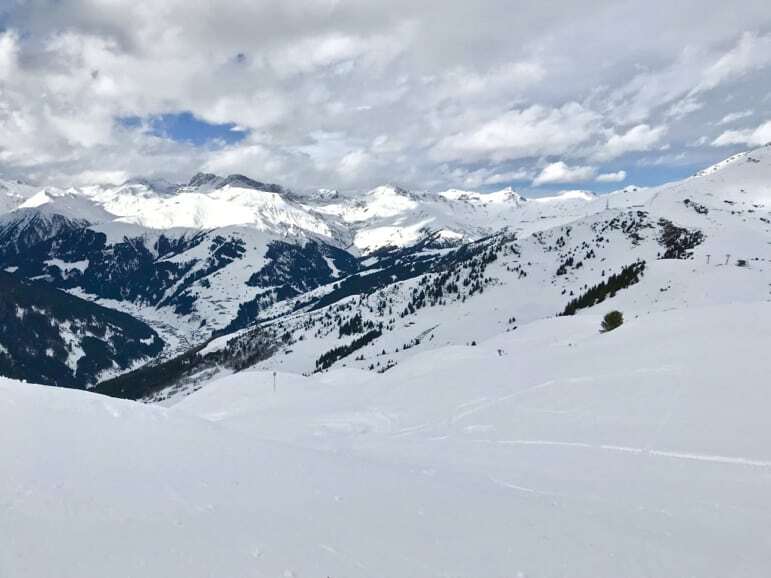 The beauty of this region is that with the glacier in Hintertux, you can ski for 365 days of the year, so you can even combine your summer holiday with a subtle flavour of winter sports. But here as the wintery clouds were parted by much-welcomed sunshine, I was ready for the real thing – January snow in all its shimmering white. And wow – what a morning! Mayrhofen is the crème de la crème of skiing for all abilities in this vast area. 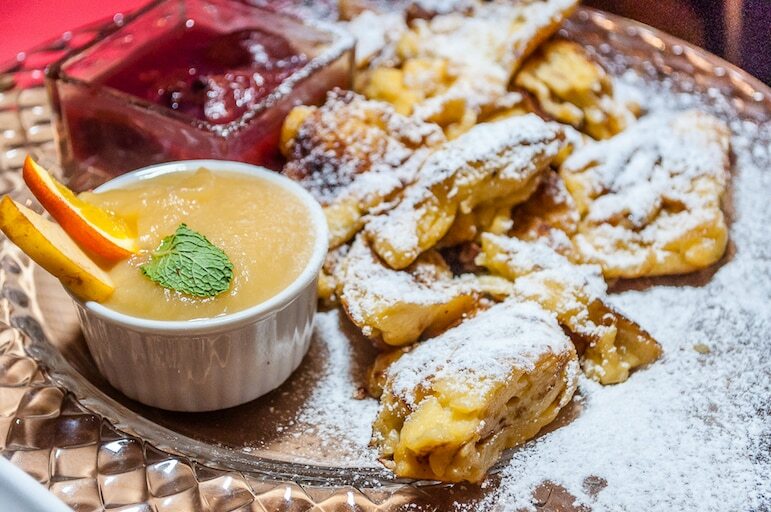 And yet, the Zillertal ski resort has yet more to tempt skiers and non-skiers alike, with an unrivalled gourmet food scene. Ascending the mountain from the Horbergbahn is more accessible if you are in your own car as there is plenty of parking at the valley lift station. There is also somewhere to hire skis and a depot with lockers so you don’t have to lug your equipment around all holiday. With my guide Florian, I skied over the Penken side of the mountain and down towards Finkenberg where there are many red and blue runs to keep beginners and intermediates amused. Mayrhofen however, is also home to steeper terrain. It claims to have the steepest pisted run in Austria – the Harakiri with a 78% incline. We didn’t attempt it that day as it was a little icy in places. Or perhaps that’s just my excuse, but I’m sticking to it! 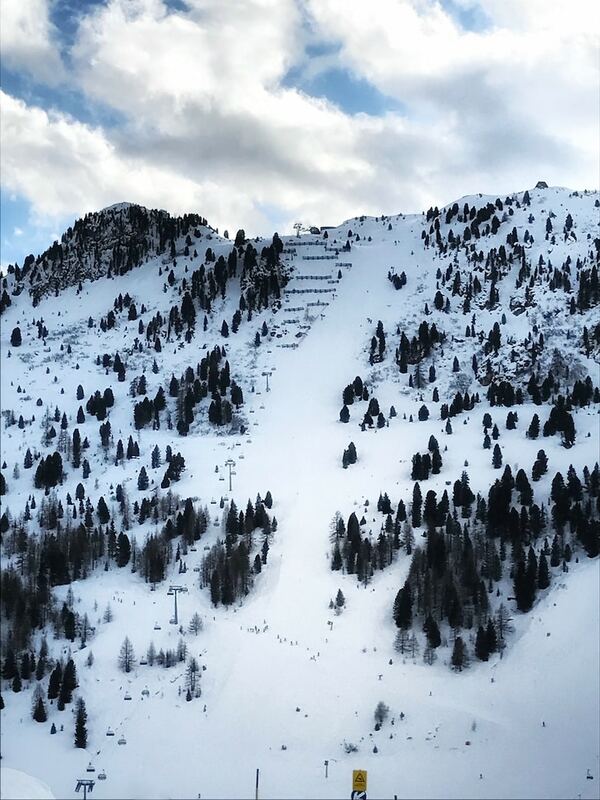 You can easily watch others take on the challenge though from either the chairlift directly over the piste (a good idea to steal your nerves and assess if you are ready for it) or from restaurants in the valley at the bottom. Lose an edge though and it’s like watching parachutists free falling – I saw skiers and boarders pick up speed and slide all the way to the bottom. Well, at least that’s one way to get down! If you are not sure you are ready for the Harakiri you could always test yourself on the other of Zillertal ski resorts’ black runs. The aptly named Devils Run (No.12) is recommended due to its pitch towards the bottom of the run. 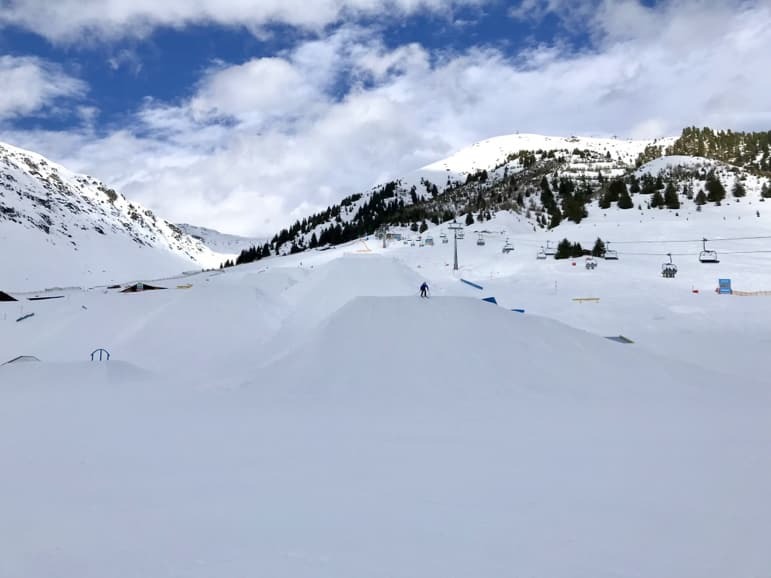 If you want to mix it up and Slopestyle is more your bag, then hit the Penken Park which has many kickers to jump and rails to ride, there are eight different areas that can be explored and they are once again suitable for all abilities. There is also a fun slope to play on if you think you may be more of a skier/snowboarder cross plus a number of restaurants close by in which to take a break while watching the fun continue in the park and on the slopes. Leaving the park we cruised the blue down to the Schneekar lift. This was going to take us to our lunch stop but not before we hit some more runs on this side of the mountain. Florian loved these runs as you were able to let go and carve up the largely crowd-free pistes. I tried to keep up, but as he used to take part in ski races and so I soon realised that was a lost cause after two or three turns. This side of the mountain had a few fun turns of its own as well with giant slalom at timed race tracks on which you could test your aptitude. There are three of them located on red run 15 off the Unterbergalm chairlift. 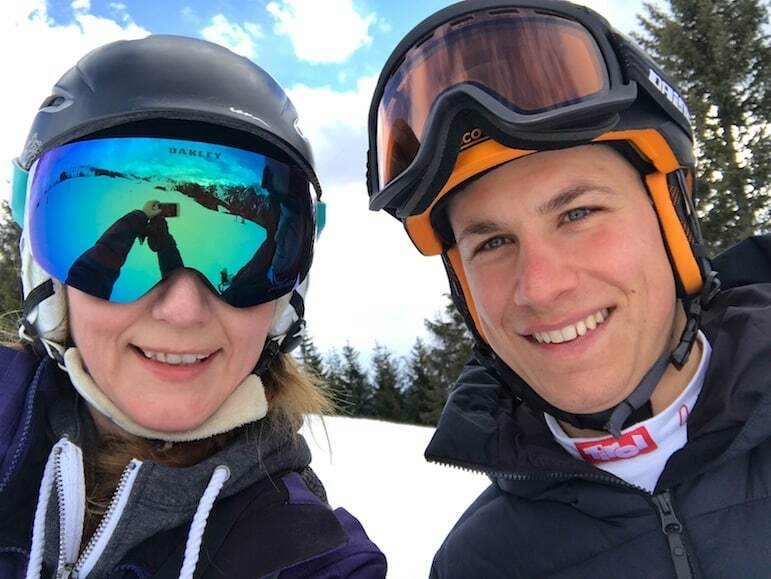 Will you have Austrian ski racers like Marcel Hirscher or Anna Veith quaking in their boots when you pick your racing line down the mountain? Perhaps not. I didn’t, but I know I’d have fun challenging my ski buddies to it, and you can even have a medal ceremony at the photo point. 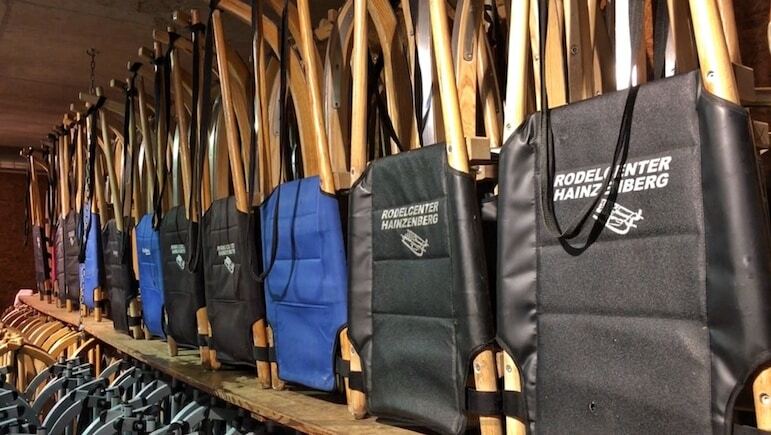 There are 80 huts in the Zillertal skiing area so you will be spoilt for choice. After a hard morning’s ski, and in need of fuel we made our way to the Schneekarhutte on top of the mountain, where we met up with Sarah. The Schneekarhütte did not disappoint – it’s about as far away from the motorway service station style eatery that you find on many mountains as is possible. This is gourmet food at its best. A favoured lunch stop for skiers and with rooms for short stays, the hut prides itself on serving organic food straight from its farm. Even the unusual pyramid-shaped building is made from wood harvested from the family’s own forest. 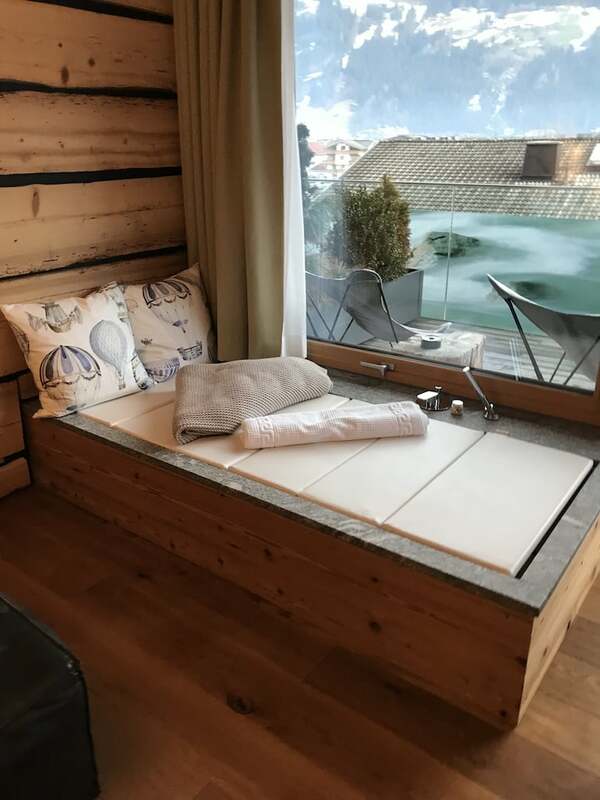 “We offer overnight stays and at 7.30am even before their breakfast people will often go for one or two runs on the slopes,” Mara Bair of the Schneekarhütte, explained. “We have seafood sometimes – some of our guests look for oysters but most of it is from our organic-certified farm. Organic produce is important to us, as is sourcing ingredients from local and small producers. 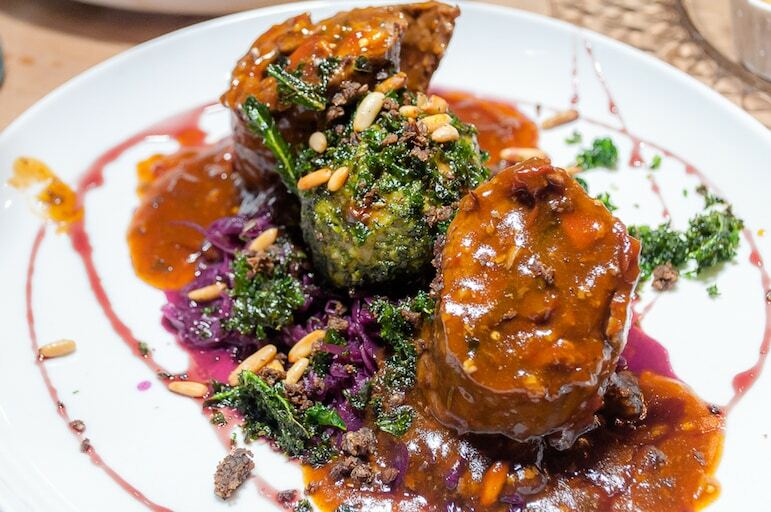 Sarah enjoyed beef roulade with mushrooms – a dish that had plenty of sweetness in its jus and tang from a soft red cabbage base. 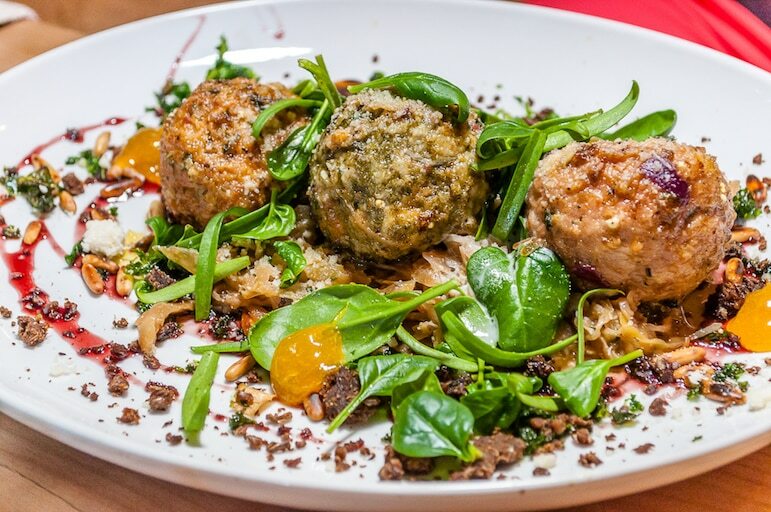 I was thoroughly impressed by the vegetarian option – a variety of dumplings perhaps perfected by Mara, who is also vegetarian, it was authentically Austrian, and oozing flavour – it must be all those mountain grown ingredients. It was far and away the best food I’ve had in the mountains – ever! The Zillertal is also home to six toboggan runs which can provide entertainment and fun for all the family. The longest of these runs, at seven kilometres long, is located in the Gerlosstein ski area. Open until 1am, it is a unique way off the mountain and offers significant aprés at rustic mountain huts along the way. Make sure you choose the Ferrari of toboggans and opt for one made of aluminium. When the snow is slightly soft, the lightweight construction ensured I overtook those on wooden toboggans with as I slid my way down the floodlit track. 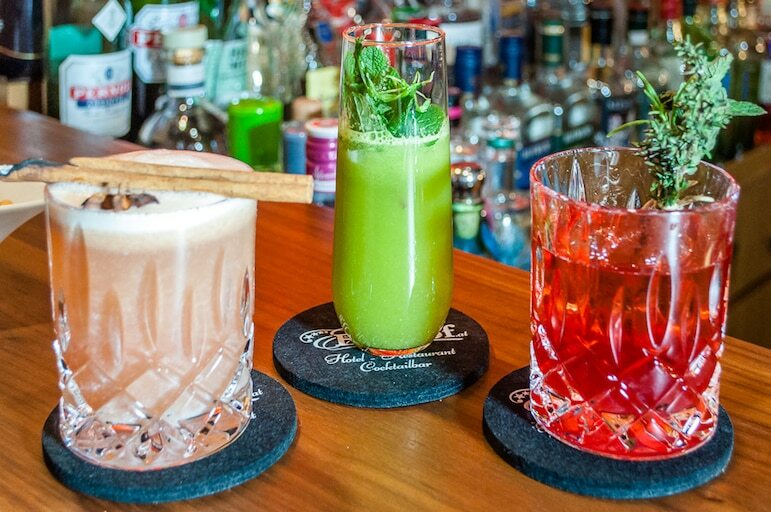 End your day back in Zell am Ziller for cocktails with a difference at Hotel Englhof. Barman and cocktail creative, Andi Englhof has gained international awards and acclaim for what he terms alpine mixology. His cocktail bar at Hotel Englhof is a treasure trove of alcoholic adventure with 2,000 spirits – including 600 whiskies, 200 gins and 40 rums – the largest selection in Austria. His alpine mixology sees mountain herbs, berries, other local ingredients such as Tirolean speck (bacon) cutting a dash alongside the best Scotch and Guatemalan rum. We tried a few and decided our favourites were the very smokey Schall & Rauch made with a deep peaty whisky, apricot, wild raspberry shrub, beetroot, sage and poppy, smoked over a block of wood; and alpine negroni where the gin was replaced with a spirit distilled from local rowanberries, and Andi burnt a bouquet garni of mountain herbs – sage, rosemary and thyme – to release all the flavour. The drinks weren’t only delicious but they gave us a fun tour of the Englhof’s spirit collection and Alpine flavours, while Andi’s passion for a good libation was fascinating to witness. 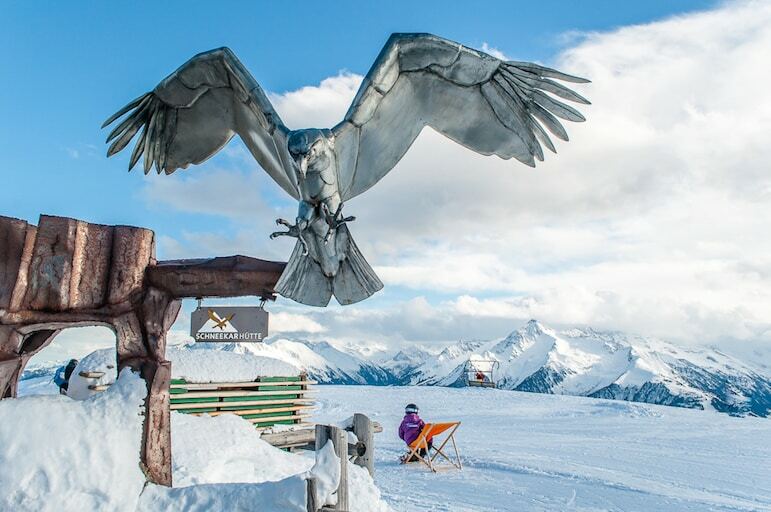 The Zillertal Valley cuts a large swathe through Tirol’s south-eastern Alps and there are many Zillertal ski resort towns dotted along the B169 road that traces its way along the valley floor. 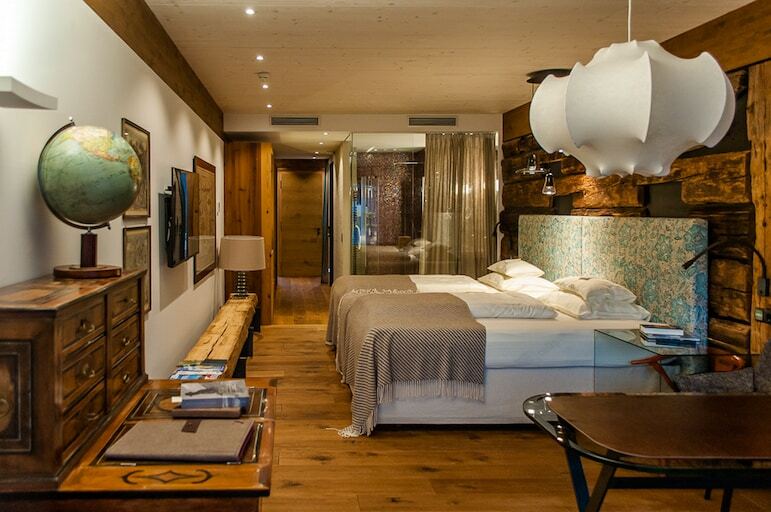 As a result, you won’t be challenged to find accommodation to suit every group of skiers. 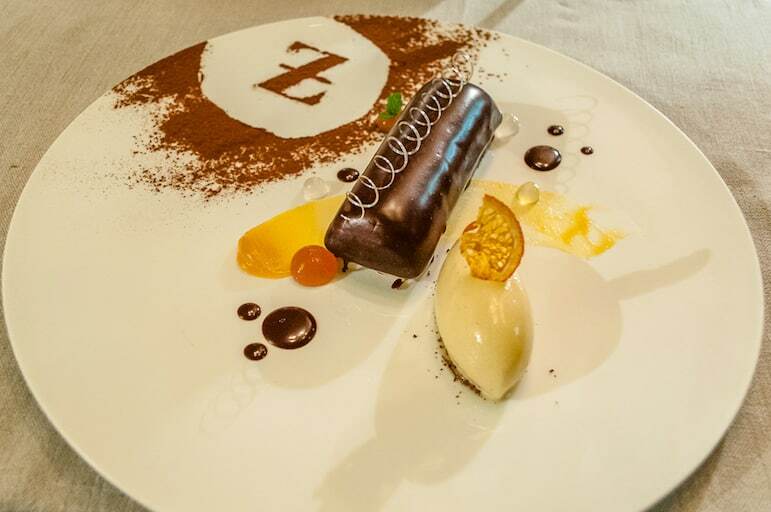 We stayed in Zell am Ziller at what has become one of our favourite luxury hotels in Austria. Das Posthotel is boutique in style, but as a Small Luxury Hotel of the World, it really delivers on comfort, character, features and service. It also features in the area’s gourmet good food credentials, with Heleni restaurant serving hearty breakfasts and dinners that tempted the tastebuds with a great array of flavours. We each stayed in a Sky Loft, which incidentally have lofty names – ours were Heinrich and Kopurnicus – and deliver penthouse features, starting with 50-square metres of living space. They also have balconies, a bar-kitchenette with fridge, espresso machine, two ceramic hobs and dinnerware, walk-in showers and separate “sky baths” – sunken tubs with a view onto the mountains, that double as exquisite day beds. But one of the things we loved about it most was the warm, characterful wood that adorned the walls and made for a long bench. Finally, the beds: “moon-beaten Swiss stone pine with natural rubber mattresses and fine bedding made of beechwood fibres”, made for comfort-inducing sleep even if it’s a confusing description. But they were so comfortable we almost didn’t want to get up in the morning. Surely that’s the kind of rest you dream of after a day on the slopes! 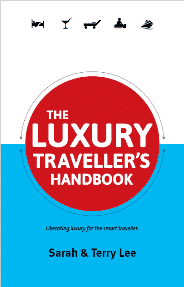 Look out for our next Austrian ski resort guide – roll up to the Skicircus of Saalbach-Hinterglemm, Leogang and Fieberbrunn and find ways to save on a luxury Austrian ski break with these top tips. 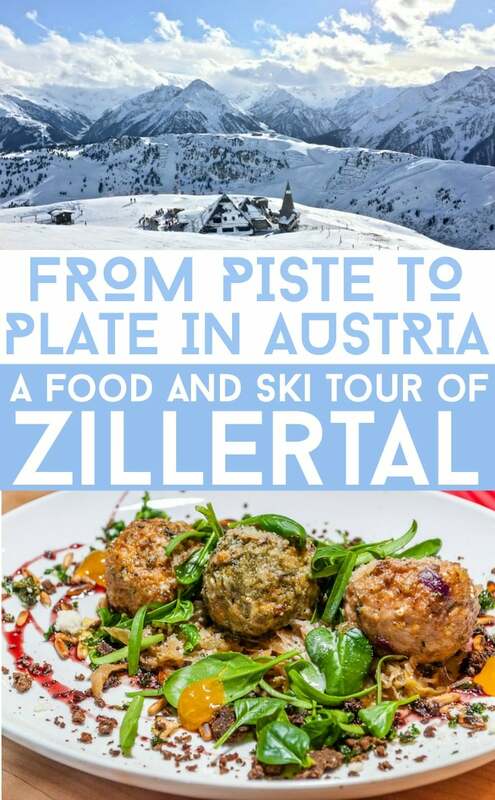 This Zillertal ski resort guide is the result of a project with Austrian Tourism – as always, all thoughts are our own.